Tanzania’s Rift Valley is only part of a continental fault system that runs 6000 km across the Middle East and Africa from Jordan to Mozambique. 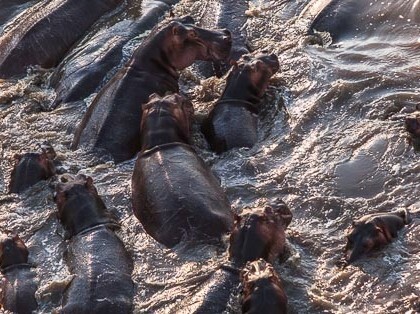 Perhaps Tanzania’s most important topographical feature, it is certainly one of the country’s great distinguishing marks, acting as a human and natural divide. With its spectacular scenery of lakes and savanna, it has come to be seen as a monumental valley of teeming game and Maasai herders, a trough of grasslands older than humanity. Although the iconic image is no longer entirely borne out by reality, the valley certainly is magnificent, a literal rift across the country, with all the stunning panoramas and gaunt escarpment backdrops you could wish for, and the plains animals are still abundant in places. The parts of the Rift Valley covered in this trip offer several exceptional lakes, lots of rocky, twisting roads, and some of Tanzania’s wildest areas. 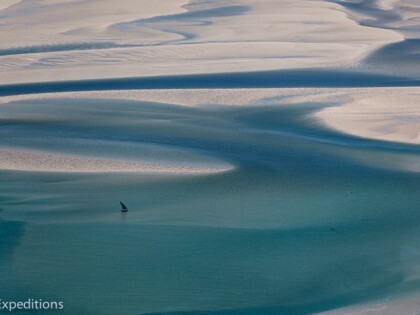 In this twelve day journey we will reach our Tanzanias remote secret places. 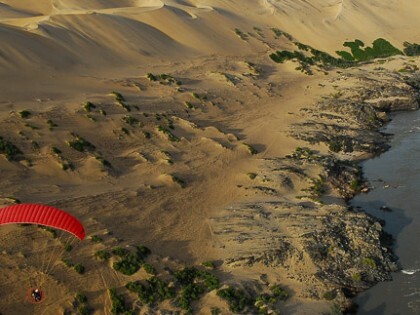 We will fly everyday above incredible scenery and we will be seeking permanently for the exceptional wildlife, out off the beaten tracks and far from any tourist circuit and national parks! Spot the biggest elephants of eastern Africa, with the Kilimanjaro as a backdrop. 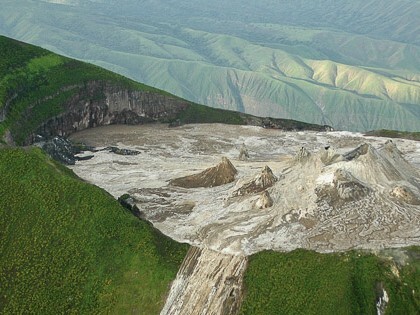 Fly over the magnificent 3.000 mt Oldinyo Lengai active volcano and the amazing craters in the area. See the amazing colors of the Natron soda Lake with it’s huge density of flamingoes. Witness the herds of wildebeest, zebras and buffalos, actors of the great migration of the Serengeti. Explore the hidden escarpments and their green plains, full of animals. 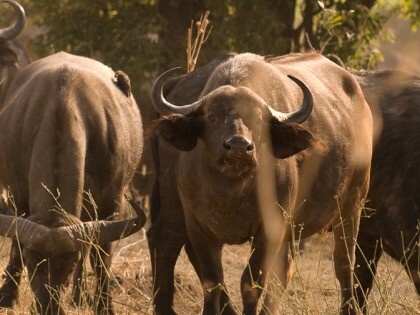 Live a real African expedition where only the Massai people and the wild animals will be your neighbors. Arrival at Kilimanjaro Intl. Airport and transfer to the quiet Lake Chala Camp in 4×4. Lake Chala is an amazing fresh water lake, at the bottom of a large crater; often we can observe elephants visiting the camp. 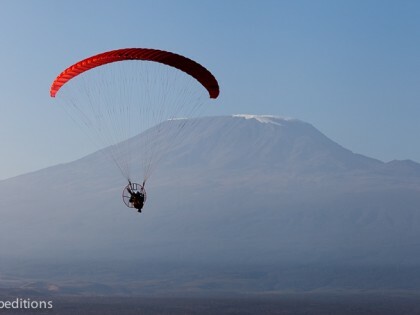 We will set up the paramotors, preparing for your first Tanzania’s flight over the beautiful crater. First briefing will be given while having a nice dinner together. We will take off at 6:00 am for the morning flight, if we are lucky we will be able to see the Kilimanjaro peak thru the clouds while flying over the lake at safe altitude, and looking for our first wildlife with zebras, impalas and elephants around. We will leave the camp after breakfast, after the staff has packed all the equipment, and will reach the Longido WMA after 2 to 3 hours of 4×4 to reach one of the highlights of the trip. We are on a sensitive area, border with Kenya, Massai owned, with probably the biggest elephants bulls of Africa. We will set up the camp in a dry place as the area is completely flat and often flooded. 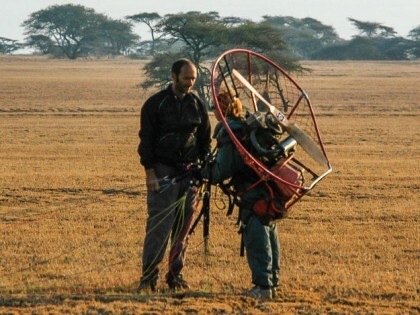 After setting up the Paramotors, and a serious briefing regarding wildlife and safety issues, we will be able to fly before the sunset, weather permitting. Morning flight by 6:00 am for 2 hours, with the Kilimanjaro as a backdrop, and an amazing quantity of wildlife. The place is technically easy to take off, with lot of space and very few obstacles. We will stay in the area and continue to fly here, discovering the endless possibilities of this amazing place. Afterwards we will have time to relax and enjoy the wild the rest of the day, waiting for the evening to be able to fly again. We will take off at 6:00 am for the morning flight and will leave the camp after breakfast, after the staff has packed all the equipment. We will carry on off road for 200 km thru the plains heading west. We will refill water in Longido and stop over for the night around beautiful hills and eventually use an old airstrip in the middle of nowhere to take off and explore the surroundings, lot of giraffes around. We can often hear lions roaring in the night. After our morning flight, and after having a good breakfast, we will continue in the 4×4 for 3 hours of off road driving heading to the Lengai area, a completely different landscape, we will see a lot of animals along the road. We will set camp not far from a Massai village, just by the border of an enormous crater with an amazing view and the Lengai at backdrop. A safety briefing and a first flight if possible! We will take off at 6:00 am for the morning flight and will try to fly over the Lengai from a take off altitude of 800 m will try to reach the top of the Lengai at 3.100 mt. above. The scenery around is absolutely amazing, with lots of craters, and wildlife in green landscape. 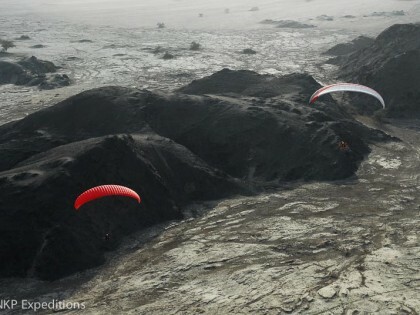 Eventually, we can fly IN the huge crater close by the camp with precautions! We can see the Natron lake, far north.. We will stay in the area and continue to fly here, it is worth of it, exploring this amazing place. Evening flight if possible and quiet night here. Take off again at 6:00 to manage the 2nd. flight over the Lengai and/or exploring the surrounds. We will leave the camp after breakfast, after the staff has packed all the equipment, and will carry north on tough off road. Stop to refill water at Ngare Sero the only river around where we will have lunch and go for an hour walk in the gorges to take a refreshing bath below the waterfalls. We will reach the Ngare Sero Camp, on the Lake Natron Shores. Briefing and a first flight over the lake if possible! Morning Flight by 6:00 am for 2 hours; above the Natron with the Lengai as a backdrop, with an amazing quantity of wildlife, flamingoes over the Lake. The place is very easy to take off, with lot of space, no obstacles. After breakfast and after the staff has packed all the equipment, we will carry on West on tough off road, to climb the 800 mts. of the escarpment and get out of the Rift Valley. We will then have to choose between two alternatives, depending on the state of track and weather conditions, to reach the top. We will stop on the plateau, and camp in the Serengeti plains, out of the national parks. Conditions and weather permitting we will fly before sunset. Lots of lions in the area. Morning flight over the Plains with lot of wildlife to spot in the endless plains. After breakfast and packing the camp, we will move in the plains looking for the next camping spot, wildlife is moving, so we must follow it. Morning flight in the plains, eventually around the Olduvai Gorges. After breakfast and packing the camp, we will move to the Natron Lake again and stop and camp there, to have a comfortable evening and eventually do an evening flight there. We refill water tanks here. 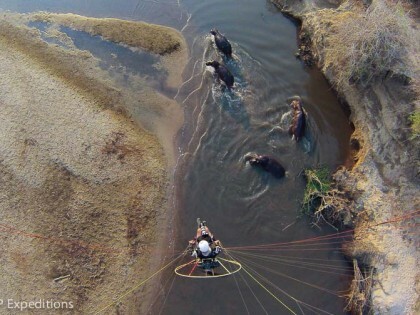 Morning flight above the Manyara Lake and after the breakfast and packing the camp, we will drive back to Arusha, and will stay at the Ngaresero Mountain Lodge, an amazing old house in the hills, for the last evening and dinner.